Popular gaming genres are often flooded with very similar games, all copying the strengths of each other. 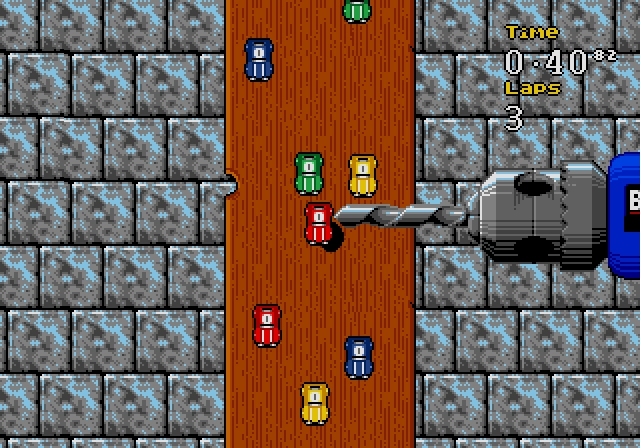 ‘Micro Machines’ was a racing game unlike no other, but does novelty mean greatness? It was January 1995 and it was Tom’s 13th birthday. I sat next to the birthday boy alongside six of our other school friends and we all had our hands on half a Mega Drive controller. Clustered around his large family TV things were getting competitive as we all tried to use our allocated three buttons to keep our tiny on screen car in the lead in the race. I was at a disadvantage: At this time I was still a Nintendo Fanboy, I had only played a Mega Drive at Tom’s house and to top it off I’d never played a ‘Micro Machines’ game before. But despite the varying skill level of the people in the room, everyone was having a great time. In these days of online gaming, couch co-op seems to be an afterthought for most developers. But clearly the youth of today are missing out as 23 years later I still remember Tom’s birthday party as one of the favourite gaming experiences. It’s was all made possible thanks to the “J-Cart” where the game’s publishers Code Masters had devised a way to incorporate a multi-tap into their Mega Drive cartridge. “Allowing up to eight simultaneous players – was the single best innovation of the 16bit cartridge era” notes Mike Dicer on Vice.com. “Two additional controller ports on the cart itself: some sort of freaking genius. If Code Masters had only come up with the thing at the beginning of the Mega Drive's lifespan, rather than in 1994, just imagine how many more games would have benefitted from insanely fun local multiplayer sessions.” Code Masters was a publisher known for their hardware innovations as much as their games. “In a sense the games that we were writing [...] at the time were a side-line to these devices” 'Micro Machines' designer Andrew Graham once told Nintendo Life. In fact it was the success of their hardware that allowed Code Masters to make a game based on a car toy line that was, at the time, bigger than Hot Wheels and Matchbox. Their Game Genie NES cheat device was distributed by Galoob across America. While it may have incurred the wrath of Nintendo, leading to an ugly lawsuit, according to Graham it had also made a lot of money for Galoob. Nintendo Life claims the America toy giant had a novel way of showing their gratitude. “The huge success of the Game Genie [meant] Galoob - now part of Hasbro - gave the plucky British company the licence for its Micro Machines toy line”. Galoob first released the Micro Machines toys in the mid 1980's, and continued manufacturing them long after. Measuring a few centimetres, they were smaller versions of Matchbox or Hot Wheels vehicles and typically came bundled with some type of play set. The Micro Machines were not restricted to only cars and trucks though. There were tanks, boats, airplanes, motorcycles, and even themed sets like monster trucks, Star Trek, and Star Wars. Many sets even came with little action figures as well. Although designers had been basing games on films for over a decade, using toys as a starting point was relatively unknown territory. “They sent us the full set of toys, which ended up strewn around the [office]," Graham claimed, "[and] We were trying to include the full range of Micro Machines”. Rather than going for realism, Code Masters fantastically decided to make racing courses from different household environments, obviously mirroring where you would play with the toys in real life. “I have to admit that I was resistant to the idea at first “recalls Graham. “Eventually I came around to it, thinking that it would certainly set the game apart from others. Once we started thinking about the kind of places the cars could be racing in, it became clear that we could have a lot of fun." The games do wonders with the license; exploring a multitude of inventive locales and pairing them with suitable vehicles. ATVs tear through Gardens, sports cars skate around snooker tables and fittingly beach buggy shoot through children’s sandpits. The game was a hit, with Magazines praising its ingenuity and simple arcade-like controls. According to a retrospective article on Nintendo Life “it stands as one of the best unlicensed games for the NES and is one of the console's best racing titles - if not the best”. Mean Machines Sega magazine shares a similar opinion in 1994. “Small is beautiful or so the saying goes and that was certainly the case as far as ‘Micro Machines’ — Code Masters' zany Megadrive racer — was concerned". In 1996, Edge magazine ranked ‘Micro Machines’ as number 18 on their "Top 100 Games of All Time", citing the "heart-pounding, adrenaline-pumping action, split-second accurate controls, and perfect balance”. A sequel was inevitable and unlike the first in the series it would debut on the 16bit Mega Drive rather than the 8 bit NES. While ‘Micro Machines 2: Turbo Tournament’ is the follow-up to the original ‘Micro Machines’ game it was not developed by the same team. 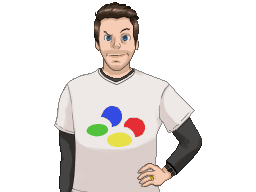 The original programmer and designer Andrew Graham had returned to university and consequently David Darling, co-founder of Code Masters, decided that they could not wait for him to finish his degree. Peter Williamson of Supersonic Software was approached to produce and program the sequel. Development began in 1993, just after the release of the Mega Drive version of the first game. The release date was set at November 1994, and, according to Williamson, there was no choice but to meet it. To add to the pressure, According to Retro Gamer, “Darling wanted it to be more than a mere continuation of the first game”. “It was hoped that they could capture and go beyond that the original game offered, and the game's success was anticipated”. Williamson knew that the sequel couldn’t just offer more content, the stages were intended to be more dynamic. "There's greater interaction with the backgrounds," Williamson claimed in a magazine preview. "For example, on the tree house track there are knots on the branches which wobble and fall off if you hit them which means when you repeat the circuit, the track and the racing technique is different". 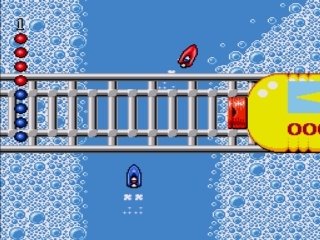 According to GamesTM, Williamson's favourite addition to the game was the sponge in the kitchen, which forced players to time their entry onto and exit from a platform. He also liked the toilet seat track. Magazines were certainly excited at the prospect of more tiny racing. 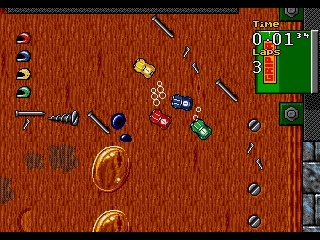 "You probably remember ‘Micro Machines’ — the nutty racing game where players leapt into micro-vehicles and hoofed around some utterly nutty tracks such as tea-tables, pool tables and sand pits" wrote Mean Machine’s deputy editor Lucy Hickman. "This sequel runs along roughly the same lines only there's more of it. At least twice as big as the original [...] with twice as many tracks ". You began with a race in the garden on ATV bikes, graduating to beach levels in sports cars; new improved workshop levels with moving drills, and the all-new pinball machine course, driven in dragsters. The NES’ breakfast table was accompanied by a dinner table stage, the lines of the course now marked out in peas, and the hazards including wine bottles, pepper pots and slippery rotating corn-on-the-cob bridge. The bonus levels retained the monster trucks, but set them in a tree house and had you collecting mini Micro Machines while trying not to plummet to a premature demise. “In the later games [they] just put in whatever vehicles was wanted, regardless of whether they had a toy for it or not” Graham mournfully acknowledged. 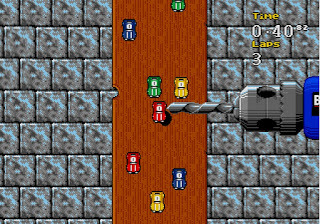 ‘Micro Machines 2: Turbo Tournament’ even has a couple of courses that forego wheels opting instead for hovercrafts and powerboats. Though there’s a visual change most levels play identically, but there is one Micro Machine that does change the game mechanics significantly. Helicopters also require players not to just think about corners but also the height of obstacles. The simple two button steering controls, doubles in complexity as now you must also press up and down on the DPad to pass over and under obstacles. The problem is the overhead graphics do not allow an easy grasp of their height, which again never seems to trouble an AI opponent. ‘Micro Machines 2’ did everything a sequel should. In new hands there was a refinement of existing mechanics, with an injection of new ideas. However, Williamson knew immediately which area of the original ‘Micro Machines’ required the most attention. "One of our first aims was to improve the graphics which some critics complained were a bit 8bit looking [so we] souped them up." 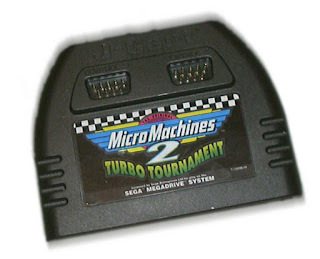 On the Mega Drive the first game looked like a port of a NES game with re-coloured graphics but ‘Micro Machines 2: Turbo Tournament’ benefitted from being built from the ground up for more capable consoles. “The sequel enjoys much more detailed graphics and everything looks suitably 16bit” claimed Sega Power. However giving Williamson credit for this isn't appropriate. According to Retro Gamer Magazine, at the eleventh hour, Darling was unhappy with the aesthetics. Big Red Software was drafted in to assist with Most of the background graphics remade by Mark Neesam, using ‘Deluxe Paint III’ on an Amiga 500. Neesam’s new wild and wacky stage designs made for a very colourful game, with great deal of subtle perspective effects that emphasise the size of the cars in relation to the world around them. Even course concepts carried over from the first game benefited from a visual overhaul. Whilst ‘Micro Machines 2’ is easier on the eye it's not all that easy on the fingers. The desire to make the game move at speed means you don’t always get enough time to react to corners and obstacles. Williamson had since said that “the team were not concerned with the difficulty increasing too quickly”. For The player’s sake they probably should have been. Unless you are blessed with lightning fast reactions you’ll likely see your tiny car flying off the course every few seconds. This is made worse by excessively sensitive controls which leave little room for error. Players new to the game are often seen veering across the courses attempting to regain control, but continually over compensating. AI opponents however seem to never make mistakes, so success in any given track seems to depend on how quickly you can recover from a single corner misjudgement. According to the Independent news paper “The computer players were pretty evil – often your nearest rival would go nearly twice as fast as you were on a straight “. To balance things out, a human player is offered the chance to take a few sneaky shortcuts, which is something the computer controller racers will never do. However success in the game requires continuous good play, so unless you know all the tracks by heart you can never win. In the default single player championship mode a player can only progress to a subsequent stage if you finish in the top two places. Failure to do that costs you a life, Lose three lives and its game over. As the courses aren’t presented in a random order you become slightly bored of replaying the first tracks repeatedly, but unless you do you can never reach new tracks that you’ll inevitably fail on. Success in a ’Micro Machines’ game seems dependant on repetition. A naturally skilled player will lose to one who has had the chance to memorise every right angled turn and both will lose to the computer unless they find shortcuts. There’s not much of a difficulty curve since the gameplay gets brutal quick. If you can get in the right mindset racing through the unique tracks can be enjoyable, but there's always the niggling feeling that the computer has an unfair advantage. ‘Micro Machines 2’ feels like a game that was intended for party play and then adapted to meet a single player requirement. As we enjoyed at Tom’s aforementioned 13th Birthday Party, ‘Micro Machines 2’ offers an eight player mode, with pairs of players both using a single controller. Given that the game is a top-down racer it wasn't really built for two player split screen let alone any more than that, so players compete in what's called head-to-head mode. The main goal of this is to simply remain on the screen as the camera follows whoever is in the lead. Veering off course will allow the remaining players to dash ahead and who ever stays on screen longest earns a point. While it sounds complicated on paper it's actually a very clever way to include multiplayer without really sacrificing the core gameplay and avoiding the need to divide the screen into eight. I can see why reviewers fixated on the multiplayer aspect of ‘Micro Machines 2: Turbo Tournament’. Joypad said “multiplayer is simply excellent”. Computer and Video Games Magazine said it is “bloody brilliant with mates”. Reviewers Richard Leadbetter and Tom Guise concurred saying the multiplayer mode is "untouchable”, “the best, this, or any year”. When played alone the game is an exercise in frustration, where a single mistake makes it impossible to win. The game literally gets better and better in relation to how many are playing. With equally matched players I’d wager ‘Micro Machines’ even challenges ‘Bomber Man’ for the crown of best Retro multiplayer game. For a 16bit fan eager to try the series for the first time, the European Exclusive 1996 edition is the best choice. As Mean Machines magazine noted “new twists, new features, same superb game”. This version improved the graphics yet further, added new cars and lots of excellent original races. In total 60 tracks are on offer with the new camping level’s race around the fearsome flames of the gas stove a definite series highlight. Alongside the introduction of solar vehicles and cop cars, are planes that are featured in a race through a nursery. There’s also an excellent jaunt around the bathtub, even though that does include a bathing gentleman who in comparison to the cars looks like a naked giant. The headline feature of this version is the construction Kit; a track editor which allows players to create their own custom courses. Although it’s flexible offering a choice of weather conditions, acceleration, speed and of course track layout, it’s a time consuming process. Thankfully you can save your races using the NVR memory chip and exchange tracks with others using passwords. It’s actually quite astonishing that there’s still people making tracks for the game and a quick internet search will reveal a wealth of passwords for custom stages ready for you to load into your game. As the years passed the ‘Micro Machines’ series of games moved onto newer consoles and transitioned into 3D. In so doing the charm was lost. Polygon cars and roaming cameras detract from the simplicity that made the original games so compelling. You can easily get distracted by fancy new textures and three-dimensional obstacles, which all make it harder to judge the course at speed. Eventually the series failed to make much of a profit for Code Master. It was a fall from greatness that coincided with the demise of the toy line on which the games were based. By the turn of the millennium, people weren’t interested in tiny cars, either on the screen or off it. In 2017 Code Masters once again tried to rejuvenate the series with a game for modern consoles, but as EuroGamer noted “‘Micro Machines'' return sits in the shadow of its superior predecessor”. Reviewers noticed that the PS4 and Xbox One iteration had call-backs to earlier games with races on Pool Tables and messy kitchen work surfaces. They talked about real time light effects, customisable cars and even the excessive amount of unnecessary Nerf product placement. However when they discussed the multiplayer modes the word "Online" was continually used. Not a single reviewer talked about controller sharing or hardware innovations that allowed for eight friends to play looking at one TV. “There's an argument to be made that magic of ‘Micro Machines’ lies in its multiplayer” EuroGamer claims. But as proven at Tom’s birthday party, real memories are made when friends gather in one place all screaming at a single TV. 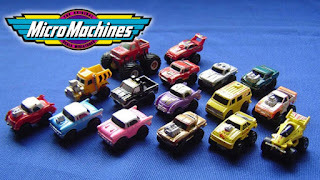 Adverts for The original Micro Machines toys included the catchphrase “if it doesn’t say Micro Machines it’s not the real thing”. I wish Code Masters has realised that if the box doesn’t say Couch Co-Op then it’s not the real experience. Like the bulk of my Mega Drive collection I got ‘Micro Machines 2: Turbo Tournament 96’ in a bulk buy on a local online selling page. The previous owner had only opened the box once it seemed and sadly (for them) the party invitations that were included when the game originally sold were blank and unsent. For a collector this was great though, as it meant I got a complete copy for a few pounds. Now if only I could travel back in time and relive my early teenage years playing the game with friends. On second thoughts, being a teenager (unlike ‘Micro Machines’) is something I don’t wish to ever experience again!